In June, I traveled to Haiti to see firsthand how gifts like goats for kids and deworming medication are transforming lives there. Our trip began in some places we’re just starting to work– desperately poor villages with great needs. Haiti is dotted with rural villages that lack development and basic services, like clean water, schools and health care. And to be honest, the poverty in this country can seem overwhelming. Belony and her brother Widlin hold the little white tablets–deworming medicine–that will make their stomach aches go away and allow them to grow. Children in tattered, dirty clothes and bare feet ran out to greet us. Some had bloated bellies—a likely sign of intestinal parasites. This was confirmed as their mothers and grandmothers talked of painful stomach aches that woke their children at night. We all watched with excitement as Belony chewed up one of the small white deworming pills we were distributing to children in the village that day. What a joy it was to be able to tell Angelicia that her little girl would be feeling much better very soon! “I’m so happy … so happy,” she said. “I pray that the next time you come, you will see a change in Belony.” We assured her that this was certain. Here are some of the healthy, happy kids we met in Lyncee, where World Concern donors have been giving goats and changing lives for many years. contrast in the appearance of the children in this village compared to others we’d seen. Their eyes were bright and their bodies looked strong and healthy. Even their clothes were clean and pressed. The biggest difference I noticed—they were all smiling and laughing as they proudly showed off the goats they’d received from World Concern. World Concern built a school here in Lyncee, more than 15 years ago. It’s totally self-sustaining now, and the classrooms are bursting with enthusiastic learners. They’re learning math and reading, of course, but they’re also learning animal husbandry through raising and breeding their goats. Delona, an 18-year-old student who is studying in 6th grade (not uncommon in rural Haiti), received her first goat last year. Her goat got pregnant, and through the sale of that baby goat, she was able to pay for almost an entire year of school. “It’s all I have, and it’s providing for us,” she said. As I was talking with the children, a sweet, freckle-faced girl with a cheerful grin caught my attention. I instantly I recognized her as a young girl I had met in 2009. Her name is Marguerite (I remembered this because it’s my grandmother’s name). Marguerite is now a healthy, growing 12-year-old! She’s doing great in school and, thanks to support from World Concern donors, she’s able to pay her tuition and other expenses through income from several goats she’s owned over the years. I was so encouraged to see the progress in Lyncee. When you give gifts through the Global Gift Guide, you are a part of this progress. Together, we are helping put an end to extreme poverty—one child, one family, one village at a time. Please visit donateagoat.org to donate a goat and change a life this Christmas. Give A Goat – A Goat Donation Works! This is Thermogene, a widow in Haiti. Give A Goat and help someone like her. Because someone decided to donate a goat, she has reason to smile. Hope for many people has four legs and goes “Maaa!” It is time again to Give A Goat! I bring this up because it is time once again to consider goats, and to invite them into our lives. I will buy several this year, even though I live in a city, and have nowhere for them to roam. I will buy several as Christmas presents for family, and turn them over to people who desperately need them. Give A Goat! It is truly Humanitarian Aid. I recently took a trip with World Concern to visit Haiti, a country filled with wonderful people who struggle to eat, learn and find work. Then, last summer, three hurricanes and a tropical storm further ravaged the country. I met families in Haiti who live on resources that would baffle most people. It is not unusual for someone to stake their livelihoods on a couple of goats, but that is exactly what people I met are forced to do. I met a sweet grandmother in Haiti named Thermogene who lost everything – EVERYTHING – she owns in the hurricanes, including goats, and she was left without an income. For Thermogene, an income comes from raising a few animals, including goats. And the storm killed every animal. When I met Thermogene, it was about 100 degrees. I was hot. It was dusty. She was dressed in her best clothes. She was ecstatic. What in the world would make this woman smile so much? Someone decided to give a goat to her through World Concern’s Global Gift Guide. Thermogene received two goats from World Concern, and with it she will be able to sell milk and sell the kids, when her goats have babies. People who donated through World Concern also gave her fruit trees. These are such simple gifts. It is easy to donate – to Give A Goat. To Thermogene and so many others, goats provide life. Posted on November 3, 2009 Author Categories Humanitarian AidTags give a goat, global gift guide, goat, goat donation, Haiti, humanitarian, Humanitarian Aid4 Comments on Give A Goat – A Goat Donation Works! Haiti Humanitarians – Great Gawky Goats! Goats are a prized commodity in Haiti. Poor families can raise and sell kids to pay school tuition. Goats makes me chuckle. Their crazy grins and non-stop noisemaking are a source of amusement for me. But I’ve seen first-hand in Haiti that these silly, awkward-looking animals provide a tremendous value to the very poor. They mean food. Income for medical expenses. 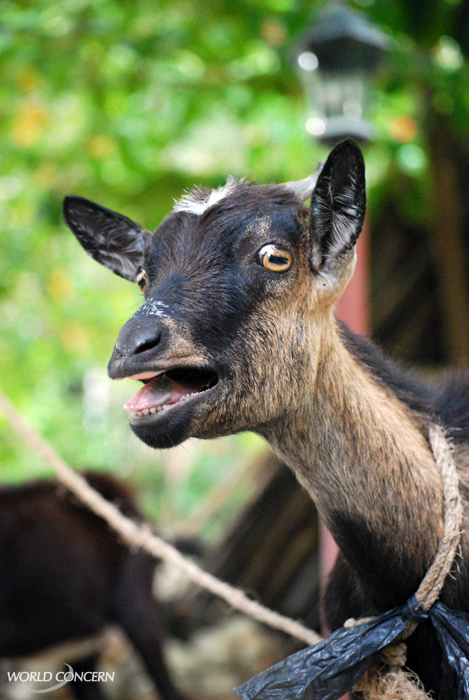 Often, a single goat can pay for a year of school tuition. It’s hope with hooves. Humanitarians at World Concern gives goats to families. Moms and dads often trust the goats’ care to children. Kids with kids, as we say. As an American, I thought of a goat as an unusual pet, but these are no pets. Goats do important work. Some families drink goats’ milk and make cheese. Goats produce quite a bit of milk every day, often enough for families to sell the surplus in the marketplace. Other families strictly raise goats to have babies. Once grown, the kids are put up for sale. I thought they might bring around $25 in a village marketplace. But in Haiti, the price of food is high. People are starving in the Haiti food crisis. These goat-keepers are able to make about $50 a goat. In Haiti, that’s a good chunk of an entire month’s income. Very often, that money sends a child to school, giving them a better future. We’ve heard some tremendous success stories, like the family of that has raised nearly 20 goats over the last decade, allowing the children in the family to go to school. They know how to raise the goats well, and have truly seized on the concept. So it’s no surprise that goats are a hot commodity. I saw grandmas receiving goats in southern Haiti. This is a country with no social support structure, so when Hurricanes decimated the region last summer, people there have been struggling. The storms killed crops – and animals. These goats were the first livestock they were able to obtain after the storm. There have been some hungry months. The grannies were so happy. A goat may be just livestock to us. For them, it’s a safety net against starvation. Watch a video on this page about how World Concern helps during the Haiti Food Crisis. 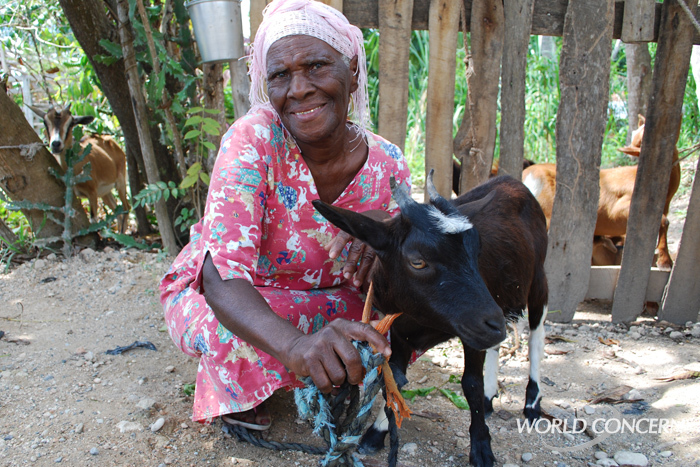 A goat provides an income for this grandmother in Haiti who has little other income. Posted on March 25, 2009 January 28, 2011 Author Categories Disaster ReliefTags food crisis, goat, Haiti, humanitarian5 Comments on Haiti Humanitarians – Great Gawky Goats!